The “Hot Mama” page (left) is a case in point. We showed the page to the editor in the idea stage. He was comfortable with it because he recognized it as clever, tasteful and — most importantly — right on point to the story. Turns out that’s what our readers recognized as well. There have been a handful of times our decisions did anger some readers, like “At the altar of pop culture” (right) a stand-alone illustration as opinion about TV violence, but we feel it’s worth the risk to push the envelope. A far more egregious sin would be tepid visuals and bland editing. That doesn’t mean we go out of our way to insult readers just for the sake of doing so, but we don’t shy away from challenging the majority only because we anticipate a negative reaction from a few. So why don’t more papers try things like this? Because, as a rule, American papers tend to edit to the lowest common denominator, which adds up to a fraction of our potential. It is both fascinating and sad that an industry which trades in intellectual capital willingly stops product development by not having the spine to support creativity. You’d think the phone would have rung off the hook with complaints, but you’d be wrong. The lesson: Don’t underestimate the sophistication of your audience. 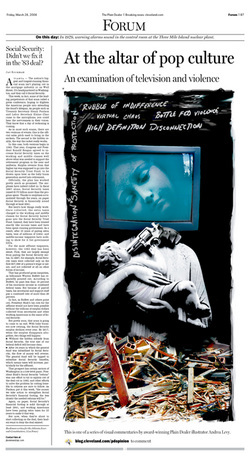 Though controversial, this “illustration as editorial” piece sparked smart dialog with readers, and was awarded a Judges Special Recognition for courage in illustration use in the Society for News Design’s 30th annual Best Of News Design competition.